The Grand National is held every year in Aintree, Liverpool. The Grand National is one of the most famous races in the world, and is the pinnacle of the jump racing season in the UK. With most sports or events, it can be tricky to find cheap hotels for the grand national however if you look hard enough you can find them. 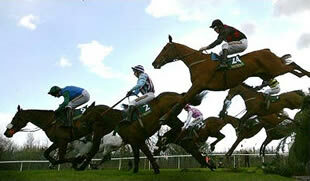 The Grand National is ran every April as part of Aintree’s racing festival in Liverpool. Over 3 days, Liverpool gets taken over by racing fans to watch three full days of racing, culminating with the race on a Saturday – 3:45pm – for the Grand National. Upto 40 horses race over some of the most physically demanding fences in racing, including Beecher’s Brook, The Chair and The Water Jump. The race is 4 miles, 4 furlongs long and in total 40 fences are jumped. The beauty of the race is that anybody can (and usually does) win. As such, it is customary for even non gamblers to have a flutter on a horse during The Grand National to try and win some money. The race rarely goes to form and some horses – who had odds of 100/1 – have won the race. In recent years, there have been shrinking of fences and other modifications to the course, this is done to protect the horses welfare, but it hasn’t dampened teh intensity of the Grand National, with the races being still hotly fought. Probably the most famous horse to win The Grand National was Red Rum, who not only lived for over 30 years, he also won the Grand National three times, in 1973, 1974 and 1977 – the first horse to do such a feat. When Red Rum died in 1995, he was buried at the winners post at Aintree. With a worldwide audience of 600 million people, and over 120,000 people attending the three day event, you can imagine that the hotels in the city are fully booked, so booking hotels early is a must. Furthermore, to get a cheap hotel for the Grand National, my advice would be to look further afield than Liverpool, maybe check out Birkenhead or Southport, both of which have fantastic rail links to Aintree. Have a look at the deals below for some great, cheap hotels in Liverpool. Welcome To Cheap Hotels In Liverpool!